Sound familiar? Phrases like these are often heard erupting from the mouths of the parents of young children. So close to the ground, infants and toddlers often find the one lost cheerio that rolled behind the couch or wriggle their way into the kitchen cabinet with no plan of how to get back out. Their eyes ever scanning their surroundings, touching everything, tasting anything, listening to the background noises we adults have learned to tune out – using each of their senses to learn about their environment. Our very young children aren’t just trying to keep us on our toes, they are actually experimenting with the world around them. Imagine what they see from their perspective, what conclusions they are reaching, and how they are growing from their everyday experiences. 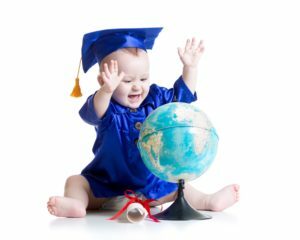 Research has changed the way we believe young children develop and learn – no longer do we see them as blank slates waiting to have our wisdom imparted, but now as thoughtful and curious beings – little scientists, themselves, discovering their world.